Over the past lessons you've seen examples of how the tonic in a major key progression (I) interacts with other chords in the scale and defines the key of the progression (e.g. A major, E major, C major etc.). What we still need to look at is how that major tonic can be enhanced/modified, just like we've done with other chords in the scale. 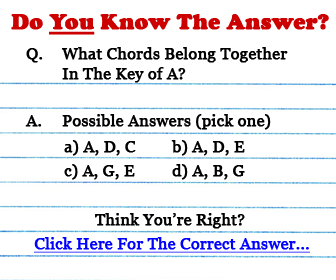 So, we already know that the first chord in the scale is a major tonic chord and how this chord is important as the root (or "home") of a major key progression. But there are different types of major chord that can work with this position (similar to how there was with the IV major chord). The idea is to experiment with these variations. Just as an artist might experiment with different textures and colours on the canvas. Major 7th chords give your major tonic a relaxed and "safe" resolution. Without going too deeply into the theory behind it, the major 7th interval is seen as a "natural" extension of the major triad, because of the 7th's position in the major scale (which is what this chord scale is based upon). The staple tonic in blues and jazz progressions. The dominant 7th chord (also used commonly in the IV and V positions as we learned previously), provides a more unstable tonic (i.e. it's not quite like home! ), but with its own distinct flavour. You'll notice I also turned that major IV into a minor iv, which is one of the variations we looked at for the IV chord. There are also extentions of these dominant 7th chords which are most commonly used in jazz and blues. Remember, as these are dominant 7th chords, they can also be used in the V position, as we learned in past lessons that the 5 chord is naturally enhanced by using dominant 7th chords (hence why this 5th degree chord is called the dominant!). More specifically on "jazzy" chords in another lesson. Added tone chords don't use the 7th like in the examples above, so these provide more neutral major chord flavours for your tonic. It's always good to add some colour to those basic major/minor triads. Don't forget the open position added chords which can sound great as tonic chords. When we talk about "resolution" we are simply talking about the ending of a musical phrase within a song. The tonic is often used as the ending chord to reaffirm that return home for the last time. As a result, it's common to "big up" that final tonic chord by extending the major chord and perhaps playing it in a different way so it sounds more vibrant. One way to attain this is to use open chords (chords which use open strings) to give the song more of a grand and conclusive finish. Simply play around with the basic chord shapes you know and see if you can beef up that ending chord. Listen to any classical or jazz piece and you'll hear how the ending tonic is milked for all its worth! This tradition carried right through into rock and pop, and for songs that don't simply fade out, the bigged up tonic is a popular choice for concluding the song. However, there are also certain tensions you can add to that tonic chord to give it a more unorthodox, unpredictable or even unsettled conclusion to your song. To me, that says "is this really the end...?" Here's the thing - from the past lessons on building the diatonic scale, you should know the root note positions. It's now up to you to experiment with the different chords you can build on these root notes. Explore the chord section for ideas. Of course, sometimes simply using that basic major barre/open chord will worj well for your song, but having these creative options gives you the variation you need, from one song to the next.